Reading, Learning & the LOVE of BOOKS! Being writers and the owners of a small publishing company, Mindy & Don are passionate about READING, LEARNING & the LOVE of BOOKS! It is their passion to instill delight in children & adults for reading, writing and illustrating and to encourage & inspire all who feel the calling to write & create their own books! 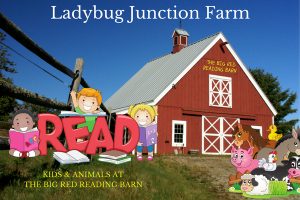 Children’s Literacy: Reading with animals in the atmosphere of the great outdoors at Ladybug Junction Farm in The Big Red Reading Barn will motivate children to see reading as a fun activity without the embarrassment or fear of reading errors. Animals love being with kids and are oblivious of any reading mistakes. Reading with animals is one of the best ways to increase confidence and the love of reading & books! Visit with the animals, take a class or read a book! It’s a space to relax, create & have some FUN down on the farm!